Numerous sophisticated link popularity software tools are available to run on your computer or as a web service. However, most have a significant problem; for their data, they rely on information that is initially pulled from the major search engines. Several take a different approach. Moz Open Site Explorer, ahrefs Site Explorer, and MajesticSEO have actually created their own indexes of web pages, so that rather than asking the major search engines for data, they use their own indexes to find links pointing to your, or your competitor’s, site. Moz currently has an index of around 187 billion pages, while MajesticSEO and ahrefs have trillions. Let’s look at https://www.dummies.com. At the time of search, there were 148 links pointing to dummies.com using the link:dummies.com syntax at Google, as noted earlier. How does that number compare with these three other systems? So if you’re looking for the most data, Majestic is definitely the way to go; many people use Moz or ahrefs because they like specific features of those systems, or they find them easier to use, while still reporting a large number of links. 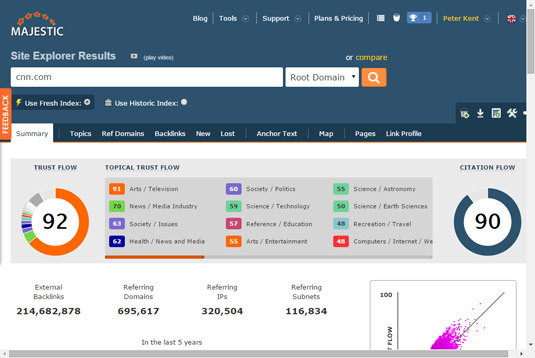 The first results page from MajesticSEO. Referring Domains: The number of domains that have web pages linking to the analyzed domain, with a breakdown of how many are educational (.edu) domains and how many are governmental (.gov). External Backlinks: The number of links from other sites pointing to the domain you specified, with a breakdown of how many are images, how many are nofollow links, how many are educational and governmental, and so on. Top Backlinks: The links that MajesticSEO thinks are the most valuable. Top Referring Domains: A list of the domains with the most links pointing to the site. Top Pages: The most-linked-to pages on the site. Map: Shows where, geographically, links are coming from. And that’s just the beginning. Create a full report to find details, and lots of them, including a full list of all the links pointing to the specified site, including where the links is placed, the link text, and the specific page that the link points to. If you “verify” that you own your website (Majestic gives you a file to place in the root of your site), you get free reports about your own site. To check links to other sites, you have to pay. It may be worth signing up for a month to do a good link analysis of competitors. Where do links come from? What sites are linking to yours, or your competitors? You can get ideas for where to ask for links to your site. What is the anchor text — the text in the links? Links with keywords are powerful. When analyzing competitors, for instance, you can often get an idea of how hard you have to work by seeing how well the links are keyworded; the more links with good keywords, the harder you have to work.